p. Ds. Darcie de Chechy, Camerar. Hospitii Dni. Regis. HODIE 2a vice lecta est Billa, for the Reformation of Abuses and deceitful Practices of Under Sheriffs, Attorneys, and Officers of the Courts of the Common Law. Eodem die, 1a vice lecta est Billa, for the Qualifying of the Statute of Provision. 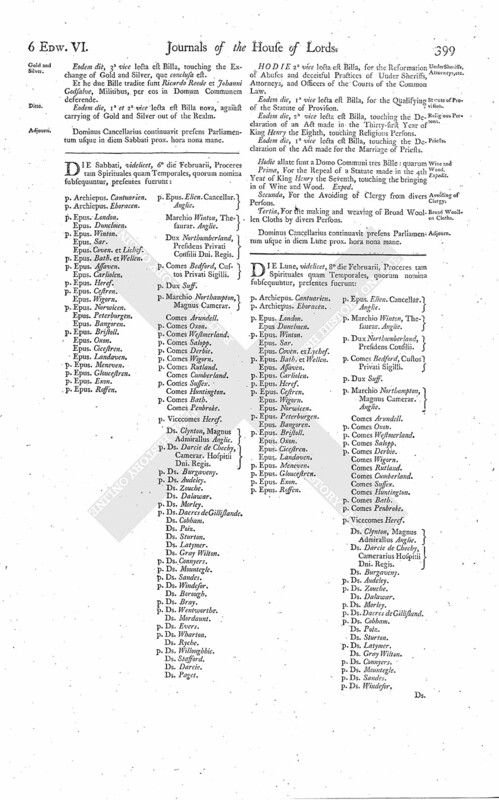 Eodem die, 2a vice lecta est Billa, touching the Declaration of an Act made in the Thirty-first Year of King Henry the Eighth, touching Religious Persons. Eodem die, 1a vice lecta est Billa, touching the Declaration of the Act made for the Marriage of Priests. Prima, For the Repeal of a Statute made in the 4th Year of King Henry the Seventh, touching the bringing in of Wine and Wood. Exped. Secunda, For the Avoiding of Clergy from divers Persons. Tertia, For the making and weaving of Broad Woollen Cloths by divers Persons.